Just before I turned twelve, my family drove to Oregon to outrun the spring. Every time it looked like we were going to stay in one town, the weather would warm up and my father would pluck us out of the life we were considering and swing us back north on the highway. I think that deep down he believed that acknowledging the change of seasons would mean admitting we were in America to stay. So from January to March the days got shorter instead of longer and the backseat windows grew colder as we slipped off the golden piecrust of California, wound through muddy mountains, and descended into a gorge where evergreens blocked out all but a strip of sky. We traveled in a red Chevrolet Malibu whose trunk held four sleeeping bags, five suitcases, a bag of shirts and jeans from J. C. Penney, and a sack of antique Persian tapestries. 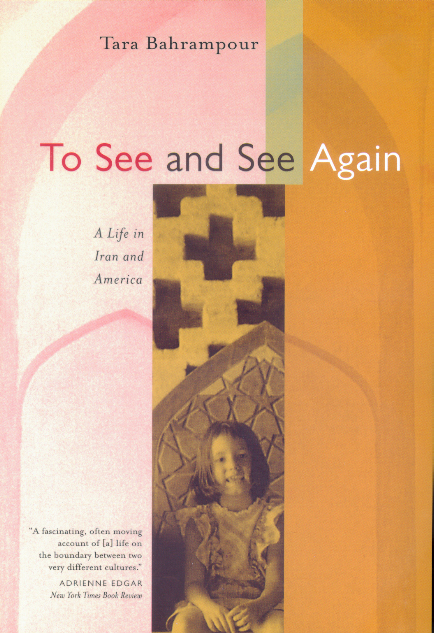 Before leaving Iran, my father had told us each to pack our favorite things in a suticase, and I had put in my new Polaroid camera, my fifth-grade yearbook, and my yellow sweat suit. We'd bought the sleeping bags and jeans when we'd gotten to Los Angeles, and as for the Malibu, my parents had opened up the yellow pages a few days after we arrived and called up the first car dealership listed. At the dealership, my mother bent toward us and pointed at a dark-haired couple and an older lady being led out to the parking lot. I heard a flash of Farsi, spoken loudly, as if they thought no one could understand. My mother is American, but she can spot Iranians immediately, even at a distance. She said a few days earlier the Department of Motor Vehicles had been packed with them, newly arrived and lining up to get their licenses, none suspecting that this red-haired, freckled woman had also just come out of Iran. In the parking lot, crisscrossed strings of red, white, and blue triangles flapped uner a cloudless sky. A long-haired man named Sonny led us along the rows of gleaming cars, their silver cursive "Malibu" logos giving them a wild, exotic aura. Sonny stopped to stroke a metallic red hood. "Seats five," he said, and looked at us appreciatively, as if to congratulate us on being a family of exactly five. "Come on, kids" he said. "Get in and show your mom and dad how much space you've got." Normally, Baba being called "dad" would have made us laugh--it sounded so American. But that day in the car lot we didn't even look at eachother. We were all watching Sonny. He pulled at the handle of the back door, it gave with a rich, oily click, and my brother and sister and I obediently climbed in. "Well? How does it feel?" Sonny's red face filled the window; his voice boomed, bossy and cheerful, through the glass. Beyond him stood Mama and Baba--and at that moment they looked pale, almost translucent, as if the bright light glinting off the tops of the cars had leached something out of them. They seemed small and far away. So, as the plastic new-car smell wafted seductively around us, we smiled and waved and stretched out our legs in all the space we had. We said goodbye to my grandparents, coasted down to Sunset Boulevard and merged onto the freeway. Three-year-old Sufi climbed over the front seat to sit on Mama's lap. Ali and I lay head to head on the backseat, our bare feet making shadowy prints on the glass as the power lines outside dipped down and up. "How long does it take?" Ali called up. We liked to time our trips. the Caspian Sea took four hours, Qom took two, Esfahan took seven. We had driven in all directions from home, and we knew how long it took before the desert sloped up into the mountains in the south and the tunneled-out rocks opened up onto the lush, rainy coastline in the north. On the way home, too, we knew when to look out for the gray sea of smog that hung over Tehran. But here, looking out the window didn't tell us a thing. It was all neat and identical and unfathomable. "Well?" Ali said. He was nine, still small enough to stand leaning over the front seat. "How many hours?" "That depends," Mama said, holding up the Triple-A map. "If we stop in San Luis Obispo it's about four hours, but if Santa Barbera looks nice we might stay there. And we want to see Santa Rosa, up near San Francisco." This was strange; we had never taken a trip that didn't have a destination. Outside the window, huge swoops of roller coaster made us sit up. "Please, please, can we go?" we begged. A few years before, when Mama was making her first record album and we were staying in Hollywood, Baba and I had spent an afternoon riding that roller coaster. Now, for one mute, hopeful moment I watched the back of his head and willed his fingers to tighten around the wheel and swerve us into the exit lane. "No, we're already late." He said it loudly and deeply--the stern-father voice he rarely used. Mama turned and gave us a sympathetic smile, her eyes lost behind big round sunglasses. "There'll be other roller coasters," she said. Simply by coming to America, it was cleear we had fallen behind. So we drove and drove, always trying to make it to the next town before it got too dark to look around. Whatever I wrote down in my new "Happy Days Diary" always turned out to be wrong. "Tonight we will stay in San Luis Obispo," I wrote--but we ended up in a Howard Johnson's in San Jose. "Tomorrow we are visiting Mama's friend in Berkeley"--but we detoured into San Francisco. So I began to take note of smaller details--the flavors of ice cream we'd had that day, the TV shows we'd watched in the hotels, the Jack-in-the-Box drive-through SuperTacos that we'd eat in the car, cranking down the windows and letting the taste of the salty beans and soggy lettuce mingle with the sweet, dry tree smell seeping down from the hills. Each week in Iran, when the international Time and Newsweek had come out, Mama would drive us to the Hilton Hotel and send me in with a handful of toumans. I would come back out, deliver the magazines to the car, and then, sitting in traffic, watch Mama read about America. Now, in America, Baba became similarly addicted to TV, but he was more obsessed. As the waitress at a roadside diner set our plates down in front of us, Baba would suddenly look at his watch and cry, "Wrap it up!" and we'd hold our food-filled napkins closed as we raced down the freeway. "The news, the news!" Baba clicked the buttons on the motel TV, frowning at the lag time before the picture bloomed over the screen. All at once, Peter Jennings's face appeared and his voice blasted painfully down onto our beds. "We're not deaf," I said, peeling the tissue off my grilled cheese sandwich, feigning indifference. We watched the whole brooadcast turned up high. During the ads, Baba frantically flipped through the other channels, trying to find Tehran, as if any second the revolution might be over and we could go back home, if only we didn't miss the news segment that told us so. A compelling and intimate exploration of the complexity of a bicultural immigrant experience, To See and See Again traces three generations of an Iranian (and Iranian-American) family undergoing a century of change--from the author's grandfather, a feudal lord with two wives; to her father, a freespirited architect who marries an American pop singer; to Bahrampour herself, who grows up balanced precariously between two cultures and comes of age watching them clash on the nightly news. New York Times, the Wall Street Journal, the New Republic, the Village Voice, and Travel and Leisure. She lives in New York City.